​Who doesn’t want a stylish comfortable pair of spectacles? People with spectacles understand the need for comfort while wearing spectacles. You do not want them to feel hard on your nose, nor do you want them to be so loose that you have to push them up your nose every now and then. 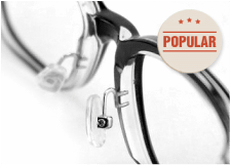 Audience these days is opting for the plastic frames because of their high durability and reasonable cost. But the struggle for comfort still remains the same. That is why adjustable nose pad inserts in plastic frames are preferable for the comfort and ease. ​Are your spectacles falling off your nose? ​Nose pads are an important factor when it comes to deciding the perfect frame for you. We know how annoying it is when your glasses keep falling off your face because they get loose over the time and changing them is like going through the whole charade. But then again new glasses tend to follow the same path and it becomes a vicious cycle. I have seen instances where people have lost their glasses at all because of this problem. 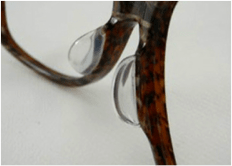 That is why we bring you adjustable nose pad arms on plastic frames of your glasses. Not only your issue of falling glasses gets resolved but wearing your glasses becomes less annoying. I have woken up several times with an impression on the nose pads of my glasses stuck on my nose. And trust me, getting rid of that impression is a big victory! That is why we offer you glasses with adjustable nose pads because that way you can adjust the frames according to your requirement. Not just any frames you will find glasses with nose pad arms for plastic frames here. ​While reading this you are probably wondering as of how to make nose pads for glasses? Nose pads are manufactured from materials ranging from hard and firm plastic to pliable and soft silicone. The nose pad conversion for plastic frames comes in various shapes and sizes. For example, nose pads are maximum oval, D-shaped, and shaped as a button and are the size of a teardrop. ​How to adjust nose pads in the plastic glasses? Some nose pads are screwed in and require a tool for that. While the ones that can be push-in type are very easy-to-use and comfortable. Because they can be adjusted in the nose bridge by just a little push, they become quick to get replaced and removed. Putting on glasses every day is a struggle which we prefer to make comfortable for you. Opt for our stylish glasses with adjustable nose pads and slide with utmost comfort through your day. We understand what your eyes need and we care about your everyday eyewear. Why compromise your style when you can get comfortable with it? Don’t waste your precious time and Shop for your desired look by getting a FREE QUOTE now!!! !